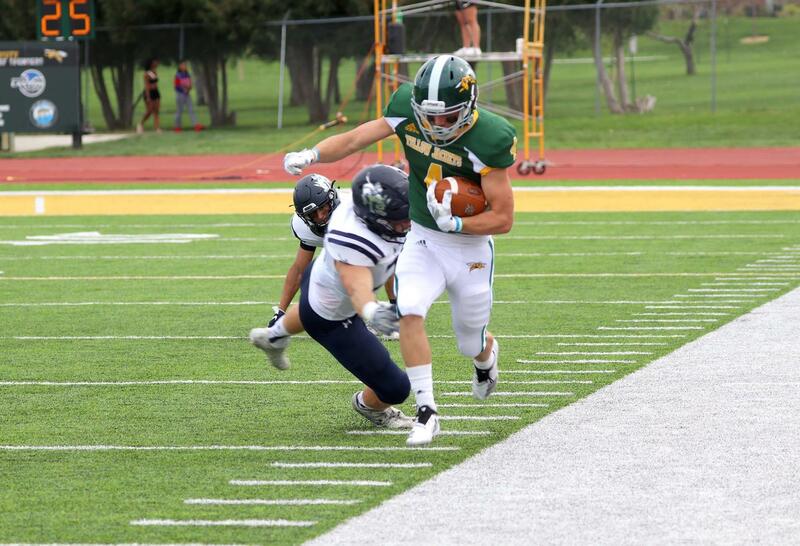 Dylan Reiners tightropes the sidelines against Adams State. ALAMOSA, Colo. – The Black Hills State University football team had a shot to win the game on their final drive, but ultimately fell, 44-41, to Adams State University on Saturday afternoon. The matchup was the third-consecutive game to be decided by less than a touchdown, and snapped a two-game winning streak for the Yellow Jackets over the Grizzlies. The Yellow Jackets (0-3, 0-3 RMAC) got the ball first, and marched down the field, capping a 71-yard drive with a Ryan Hommel one-yard quarterback keeper, to lead, 7-0. On the ensuing possession, Adams State (1-2, 1-2 RMAC) responded with a field goal, before forcing a BHSU three-and-out, and then scoring a touchdown to go ahead, 10-7, with five minutes remaining in the first. The back-and-forth continued, with the Green and Gold responding with a touchdown of their own. With 3:43 remaining in the quarter, Dylan Reiners caught a 24-yard pass from Hommel for his first touchdown of the year. BHSU took a 14-10 lead into the second quarter, however, Adams State scored on its first two drives of the second, retaking the lead, 24-14. With 1:44 left in the half, Trey Fleming knocked in a 29-yard field goal to bring the Yellow Jackets within a touchdown, 24-17, but the Grizzlies responded with a touchdown to go up, 31-17. The Yellow Jackets got the ball back with 44 seconds until halftime. They quickly marched the ball down the field, and Fleming kicked a 29-yard field goal as time expired, as BHSU entered the break down, 31-20. After a high scoring first half, the defenses began to establish themselves in the third quarter, with neither team scoring for the first nine minutes of the period. With 6:09 left in the third, Adams State scored a touchdown, and after Luis Bach blocked the extra point, BHSU trailed, 37-20. The Yellow Jackets immediately responded, scoring a touchdown of their own with 4:37 left in the quarter. Jordan Pace caught his first career touchdown, and the Green and Gold drew within 10, 37-27. On the first play of the fourth quarter, the Grizzlies scored a touchdown, but once again, Hommel and the Yellow Jackets immediately countered with a score of their own, this time a 3-yard rush by the senior quarterback. After the BHSU defense held firm, the Yellow Jackets used a 10-play, 80-yard drive, culminating in a Jack Walbye touchdown, the first of his collegiate career, to get within three points, 44-41. The defense got another stop, and the Green and Gold got the ball back with 3:49 remaining, and a chance to go ahead. However, a fumble ended the BHSU threat, and the Grizzlies were able to run out the clock and secure the three-point victory. "Missed opportunities were the story. We've got to be able to capitalize and not make mistakes on the little things. We played well in some areas, but it's not good enough," said head coach John Reiners. "We had a good start, and some good things happened. We have to go to work this week and we're going to continue to battle and be ready next week." Ryan Hommel threw for 383 yards and two touchdowns, while rushing for 73 yards and two touchdowns. Jack Walbye rushed for a touchdown, while Dylan Reiners and Jordan Pace each caught a score. Trey Fleming was 2-for-3 on field goals. Defensively, Luis Bach and Austin Goddard each had 10 tackles, including eight solo. Brett Lamb had eight tackles. For the Grizzlies, Nick Rooney threw for 308 yards and four touchdowns. Tyree Harris rushed for 254 yards and two touchdowns. Marquese Surrell (129 yards) and Chad Hovasse (89 yards) each caught two touchdowns. The Green and Gold will remain on the road, traveling to Fort Lewis on Saturday, September 22. The game in Durango, Colorado, is scheduled to kickoff at noon.